Dental bridges are a type of prosthetic device that is used to replace one or more teeth that are missing. They are usually made out of metal, gold, silver, ceramic, or porcelain. 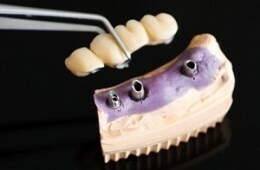 Unlike removable prosthetic devices like dentures, dental bridges are cemented to the teeth, or to an implant surrounding the empty space, and only a dentist can remove them. The dental implant that can be used to attach a bridge is called an abutment. An abutment serves as an anchor for the bridge. The replacement tooth, or pontic, is then attached to the bridge that covers those abutments. If a dental implant is not used, a dental bridge is usually attached by first reducing the surface of the teeth so that they can support the bridgework. There are three types of dental bridges: cantilever bridges, resin-bonded bridges and traditional bridges. Traditional bridges are the most common type of dental bridges, and these types of bridges are usually made of porcelain fused to metal or ceramics. Porcelain is the most common type of material used for fabricating crowns and bridges. It is a tooth-colored material that can be matched to the shade of your remaining teeth. Porcelain can also be formed to recreate the look of your natural tooth enamel and gives your bridge a strong base to rely upon. Dental porcelain is a durable type of bridge that can withstand anything you eat, in the way that natural healthy teeth can. Porcelain also has glass-like whiteness that scatters light, and so it appears like natural tooth enamel. A porcelain dental bridge is a useful prosthetic device because porcelain is durable. Porcelain dental bridges are an efficient and practical solution to replace any lost teeth. Using porcelain dental bridges is generally considered safe, but there are some potential risks to be aware of. Be sure to set up an appointment with your cosmetic dentist and ask them about the precautions for the specific dental bridge procedure you are considering undergoing.